Shūgunba Sensan, #44 in Klompmakers' book, is armored, but bare-headed in the snow, carrying a pole with a large, barbed ring at the end of it. Sensan, like many of the figures in the Suikoden, starts out as an imperial commander sent against the gang of bandits. However, he is defeated by a female warrior and he then changes sides. In a plot to rescue two captured members of the gang Sensan takes part in an attack on Beijing during the Festival of the Lanterns. 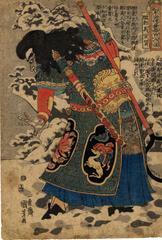 In this print Sensan is shown standing in wait in the snow outside the city waiting to capture or destroy fleeing enemies. If you look closely you will see three propitious symbols in the panel decorating the bottom of Sensan's protective armor: a blue bat, a kylin (麒麟) and a ju-i (如意) fungus which appears to be walking.